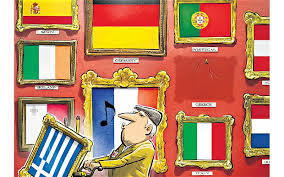 So everyone (us sometimes too) has said Greece is SUCH a small country and there has been SOOO much time to prepare for a possible Greek exit (Grexit) from the Euro that it should not affect the capital markets. Markets didn’t listen to the pundits. The tone of each day for the last few weeks has been set by the rumor mill of the Greek demise or resurrection. Even interest rates have been acting like jumping beans. Not only that, but once markets/rates start moving, due to summer doldrums, they just exaggerate for the day whatever direction its pointing. Our recommendation, ignore the noise! Next week brings more exciting news for our office, as well as a mid year mark, and a holiday weekend…. Ahh … but that is next week. Today is a Friday … enjoy your weekend and if you are on the road, be safe out there ! This entry was posted in Investing/Financial Planning, Market Comments, World Political and tagged EU, Euro, Greek, Greek Exit, Grexit. Bookmark the permalink.